This product is a good, lightweight addition to my school experience. It&apos;s very compact and incredibly easy to travel with. The speed is very fast and has good storage options. The portable keyboard is great; easy to use keys and is not easily damaged by liquids. The Pros were the compact travel options;lightweight and thin. Moreover, it has windows 10 and is very fast. Moreover impeccable storage options. However, it is extremely fragile and a single drop can cause a lot of damage. It is prone to drops due to its design which despite being relatively efficient , limits the movement of the screen and makes it much less sturdy; increasing the damage potential. * Touch sensitivity is not so good as my previous hp laptop was. * No guarantee provided for Broken screen and its repair cost is also too high . While the hardware design and functioning is great, with the best keyboard, Windows 10 still has some bugs, but the blame can&apos;t be on the device&apos;s side. This laptop is more of a consumption device than a gaming device. Every aspect of the hardware design is good. Keys have a nice travel. This device is made to run on Windows 10, while the OS is made while keeping it in mind hence you&apos;ll get the best Windows experience. Would heat up and make minimal noise on using high-end apps like Premiere Pro. This product is a good, and lightweight addition. It&apos;s very compact and incredibly easy to travel with. 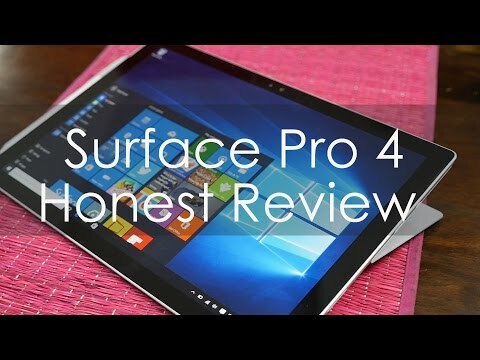 5 Pricebaba users have written their experience with Microsoft Surface Pro 4. If you own Microsoft Surface Pro 4, please do leave your feedback too. The Surface Pro 4 is an ultra-thin and versatile offering from Microsoft. It is a device that enjoys the best of both worlds, being a tablet as well as a PC. It also runs the latest version of Windows to keep it up to speed with all latest updates in productivity and security. The Surface Pro 4 features a 12.3inch high-resolution PixelSense display that also doubles up as a capacitive touch screen. It also provides support for the Surface pen that can sense up to 1,024 levels of pressure sensitivity to produce different outputs. The exterior of the device is fabricated of Magnesium and comes in a silver colour variant. The Surface Pro offers a configuration of 6th Gen Intel i5. It also comes with Intel HD Graphics 520 with the i5 processor. This combination ensures a smooth functioning device that gets you through your day. The Surface Pro 4 runs professional grade Windows and Office out of the box. For the shutterbugs, the Surface Pro 4 rocks an 8MP rear-facing camera that is capable of recording 1080p HD videos. It also has a front-facing 5MP camera that is also capable of recording video of up to 1080p. Microsoft offers a data storage option of 128GB in the form of SSD. Under the hood, the device is powered up with a 5087 mAh battery backup to keep the device running for up to 9 hours of moderate usage. The connectivity options offered include WiFi 802.11ac a/b/g/n compatible and Bluetooth 4.0.